Look for an email containing a validation code and additional program details from Ford 1-2 business days after purchasing or leasing your new Ford car, truck or SUV. 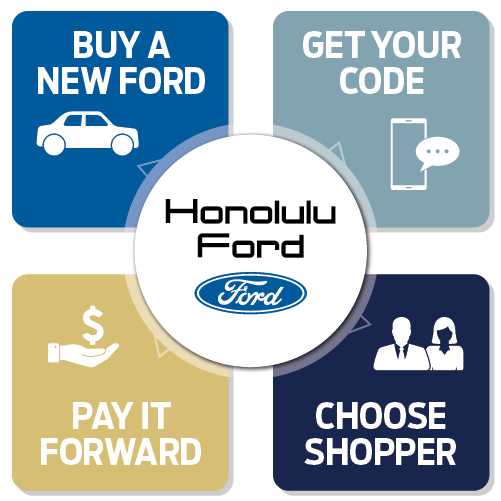 Go to FORDDRIVESITFORWARD.com and enter the validation code and the contact info of the lucky recipient of $500 Bonus Cash toward a new vehicle purchase or lease. A confirmation email containing a unique certificate will be sent to the recipient, who can then print and present it to HONOLULU FORD for $500 Bonus Cash! Disclaimer: 2017/2018 vehicles: $500 on most Ford vehicles. Not available on Ford GT, F-150 Raptor, Focus RS, Mustang Shelby GT350. May not combine with other private, conquest or commercial offers. A/Z/D Plan ineligible. Nontransferable out of household. Limit one per customer. U.S. residents. Must redeem using generated certificate number. Prior purchases not eligible. Take new retail delivery from dealer stock by 03/31/18. See dealer for details.